Ravenna is a town of bicyclists. I have never seen so many people riding bikes through all the streets, wearing all kinds of heels, talking on their cell phones, pumping their tiny children in front with no helmets. So, of course we joined them. The tourist office allows you to rent yellow bikes for free. Caroline and I are both a little wobbly on bikes, so we tried to take the back streets. At one point, we went down a cobblestone street, and there was a baptistry. We could tell, from our morning sightseeing of mosaics, that this was probably a notable sight. We got off our bikes, walked in, looked up, and it was so magical. 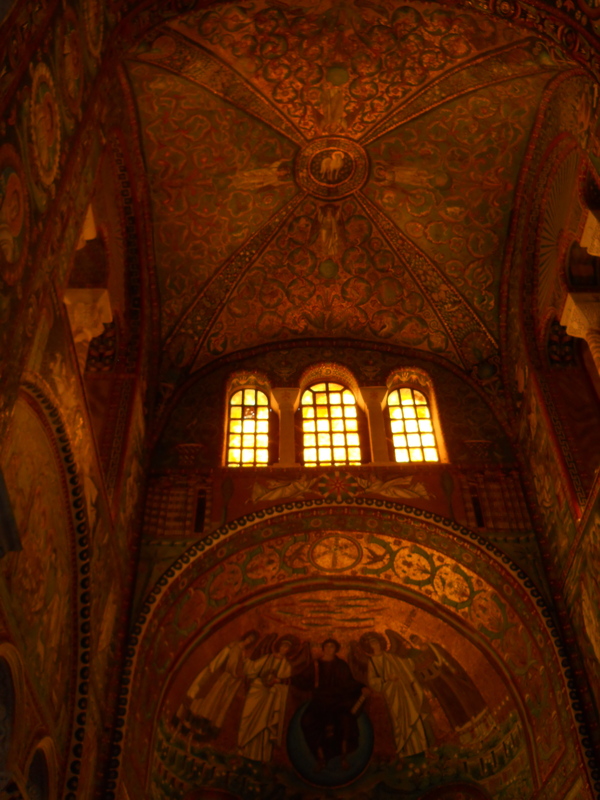 See photo above: a gorgeous mosaic crowned the dome above us– all blue and green and gold and sparkling in the late afternoon sun. You can Google the place: Battistero degli Ariani in Ravenna. 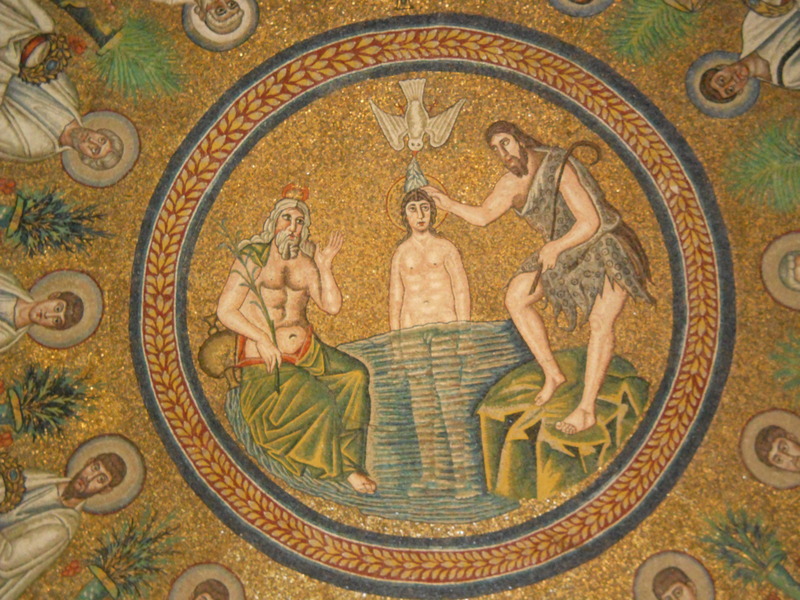 The mosaic was of Jesus being baptized in the River Jordan. All morning we walked from church to museum to mausoleum to see the mosaics. They are all the more amazing for when they were created. They date from the 400 – 540 A.D. We’re talking about after the fall of Rome, the darkest era of the Dark Ages, but Ravenna was the westernmost port of the Eastern Roman empire, which didn’t fall until the time of Columbus. We love how few tourists there are in Ravenna at this time. Tomorrow Sirolo on the Riviera Conoro. 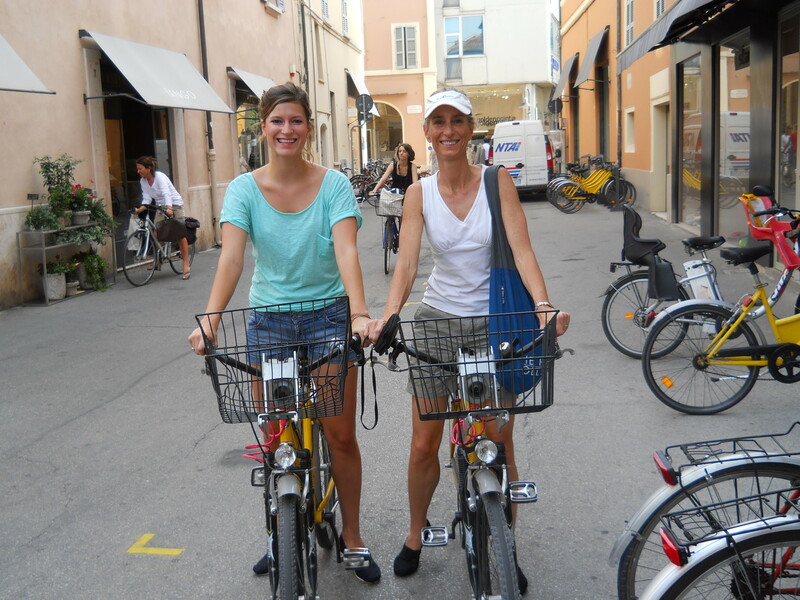 I loved Ravenna, even though I was almost run down by a bicyclist! Love your mosaic photos. Elizabeth, you’re part of the reason we’re here. It’s been great, but we head out to Le Marche tomorrow to a beach town called Sirolo. Now must go see what you’re up to in NYC!